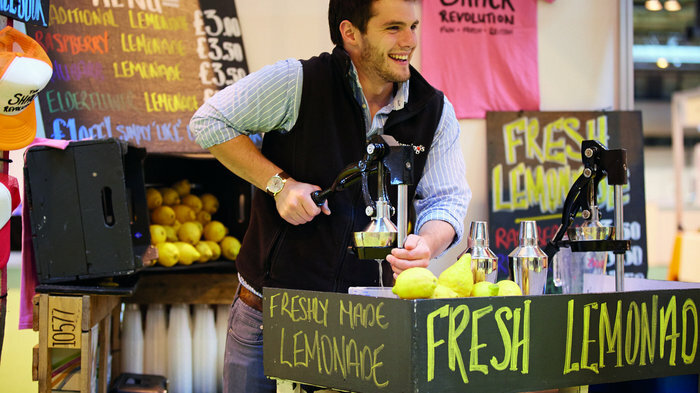 London boasts a year-round programme of food festivals that provide a treat for all palates. However, the summer months are the ideal time to turn an outdoor space into a foodie's heaven. Read on to find out the best of what the capital is serving this summer. Meet Bake Off finalists and famous chefs on the second Bank Holiday weekend in May. The Foodies Festival returns to Syon Park this spring bringing Bake Off finalists and famous chefs to leafy west London on the second Bank Holiday weekend in May. This year's line-up features a range of culinary elite, including the likes of Matt Tebutt and Michelin-starred chefs Atul Kocchar, Glynn Purnell and Josh Eggleton to the Chefs Theatre. Great British Bake Off winner Sophie Faldo is joined by finalists Steven Carter-Bailey and Kate Lyon in the Cake & Bake Theatre. New for 2018 are workshops on the power of plant based proteins, gut-friendly food and craft tea. With over 20 street food outlets, the Pimms Teapot and cookery classes for kids as well as garden games and a pie throwing contest there's a lot to get your teeth stuck into. Reggae, afrobeat and new wave jazz, served with a side order of top London street food traders. On the second Bank Holiday in May KERB is stepping off the concrete to bring you their first music festival on Peckham Rye Park. Join Jam on Rye for a mix of reggae, afrobeat and new wave jazz, served with a side order of top London street food traders (after all, this is what KERB does best), summer cocktails, special local talent, talks and family activities. Breddos, White Men Can't Jerk, Only Jerkin' and more KERB favourites dish up the food. Set across three stages, the main stage is curated by Reggae Roast and headlined by David Rodigan, Horace Andy (Live) and Mungo's HiFi, and the second stage hosted by south London promoters 'Wormfood'. The third stage hosts 'KERB Talks', a panel discussion on London's sounds system culture and local talent. Over 50 of London's top restaurants showcase their signature small plate dishes. The Soho Food Feast aims to bring together West End restaurants, clubs and bars to enjoy a summer's day in one of Soho's most scenic green spaces. Over 50 of London's top restaurants will be serving signature dishes and house wines all afternoon from stands located throughout St Anne's Churchyard Garden. Enjoy dishes from the likes of Ember Yard, Brindisa, Temper, Ceviche, Bone Daddies, Ducksoup, 10 Greek Street, Dean Street Townhouse, The Mandrake, The Blue Post and many others for just £2 each and see some top chefs giving live demonstrations. Expect live music and DJs and the odd A lister celebrity popping by, a very generous raffle on both days as well as activities for families. More than forty of London's best restaurants pitch up at Regent's Park. Five days of top flight food, drink and entertainment at Regent's Park, Taste of London is a wonderful al fresco summer festival of all things food. The impressive restaurant line-up for 2018 includes ROKA, Kricket, Salon, Michelin-starred Club Gascon, Sri Lankan Soho hot spot Hoppers, and Duddell's among over forty of London's best restaurants. Making their debuts are Portuguese restaurant Bar Douro, Mexican taqueria El Pastor, West African Ikoyi, vegan Mexican restaurant Club Mexicana and Amalfi-inspired Italian Sorella. It's a wonderful excuse to indulge in some delicious gluttony as you work your way through sample sized dishes from London's top restaurants. Top chefs attend, including a flurry of Michelin starred names, and give demos to show off their culinary handiwork. Festival favourite At The Fire Pit features all things fire and smoke with Josh Katz (Berber & Q), Pip Lacey (Hicce), Leandro Carreira (Londrino), Andy Oliver from Som Saa and David Carter of SMOKESTAK fame. Sharp's Brewery will also be in attendance, bringing a taste of Cornish adventure to London with the chance to sample their beers, including the UK's number one cask beer Doom Bar, and play a game of Beer Ping. From spring 2018 the market pops up in King's Cross every Friday, Saturday and Sunday. From March 2018, Canopy Market in King's Cross becomes a weekly affair. Previously a once-a-month occasion, the one-stop-shop for artisan produce will now take over West Handyside Canopy every Friday, Saturday and Sunday. The beautifully restored Victorian market site, which was previously the site of a potato and Sunday fish market in the 1800s, will now see artisan produce, unique designs and indulgent street food served under the striking glass and steel roof. Regular retail producers include Studio Nell, Modla, Bob Bear, and Visual Flux while food traders include Bread Ahead, The Charcuterie Board, Brisket & Barrel, and BAP Foods. Drink comes from Elephant Juice Bar, Four Pure, Brevevita and Red Hill Farm Estate. Furthermore, every Friday evening the market will stage Canopy Sessions, staying open late to host a line-up of musicians and DJs. Over 60 breweries under one roof. The London Craft Beer Festival returns for its 6th year in 2018 and it's moving to Tobacco Dock, which will be the event's residence for the foreseeable future. The popular event will return with over 60 breweries, hundreds of beers, talented chefs and hot DJs for three days of fun. The soundtrack to this year's festival is supplied by Greg Wilson and Hercules & Love Affair on Friday night, Huey Morgan, who's doing a DJ set on Saturday during the day, followed by a Two Door Cinema Club DJ set and Everything Everything on Saturday night with The Heatwave, Trojan Sound System and TODDLA T wrapping it up on Sunday. Hand picked breweries include Lindheim Olkomani from Norway, Stillwater for the USA, Mahr's Brau in Bavaria and The Kernel, one of London's finest breweries, based in an archway in Bermondsey. A three-day celebration of America with food, booze and music. This June, KERB presents the tastiest hoedown in town, bringing together a range of Deep South menus for Noshville. The three-day festival is a celebration of America with the likes of Taco Dave, Oh My Dog, Da Ja Chicken and Prairie Fire Dog serving mouth-watering creations. Expect burgers, hot dogs, fried chicken, spicy meat nuggets, mustard fried chicken wings and pulled pork with homemade smoked sausage, smoked bacon and Fran's RedHot infused BBQ sauce. Drinks include melon margaritas, Cajun lemonade and mint julips while sweet treats include donuts and ice cream floats. The festival also presents the Maverick Travelling Medicine Show with live entertainment from twelve different acts. Make the most of the long weekend with this delectable foodie festival. From cheap budget places to stay to luxury 5 star suites see our deals for hotels, including Hotel Indigo London Paddington from 61% off.